We have nothing but fabulous things to say. Cyndi was beyond amazing and truly made us feel at home. 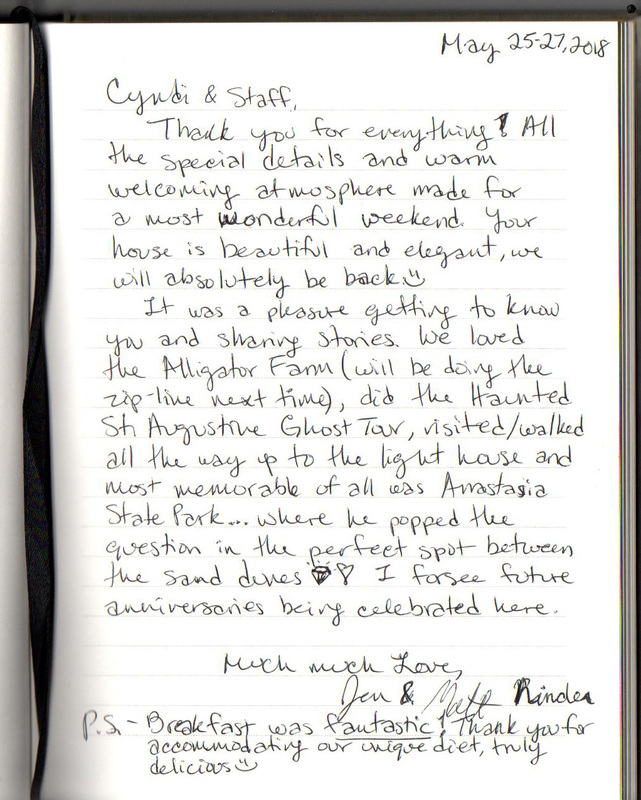 We booked and stayed in the Sanibel Suite, but Gina and Cyndi upgraded us on our last night to the Saint Augustine Grand. We came here to celebrate my college graduation and Jon’s birthday (May 9th) which also happened to be the day he proposed! The staff is excellent and the breakfasts are amazing!! (Don’t forget the brownies) Cyndi’s recommendations were superb and she never steered us in the wrong direction. This place truly feels like a second home to us. It will always be special to us and we will definitely be back!